35.2 mm stainless steel case, sapphire-crystal back, blue opaline dial with gold applied hour markers and numerals with luminescent coating, caliber 324 S C self-winding movement with date in an aperture and center sweep second hand, approximately 35-45 hours of power reserve, stainless steel bracelet, fold-over buckle. Water resistant to 60 m.
35.2 mm stainless steel case, sapphire-crystal back, silvery opaline dial with gold applied hour markers and numerals with luminescent coating, caliber 324 S C self-winding movement with date in an aperture and center sweep second hand, approximately 35-45 hours of power reserve, stainless steel bracelet, Nautilus fold-over buckle. 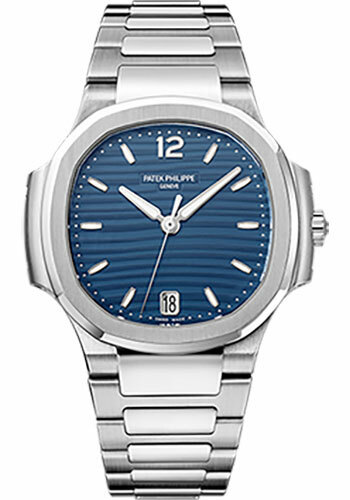 Water resistant to 60 m.
35.2 mm stainless steel case, 8.62 mm thick, sapphire-crystal back, smoke gray dial with gold applied hour markers and numerals with luminescent coating, caliber 324 S C self-winding movement with date in an aperture and center sweep second hand, approximately 35-45 hours of power reserve, stainless steel bracelet, fold-over buckle. Water resistant to 60 m.